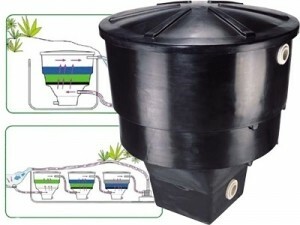 One single standard unit suitable for water gardens up to 20 Ton / 5,300 Gallons. Versatile and modular application, state of the art progressive filtration, the Matala filter media with 3-dimensional structure and high free volume, easy installation, transport friendly. Dimensions: 42 inch diameter x 40 inch tall. Contains approx 150 gallons volume. Can be used as Vortex or as combined Vortex + Filter. One tank can be applied as a single filtration unit. Several tanks can be applied as modules in a multi-chamber filter. For better step-wise transition from mechanical filtration to bio-filtration. Active, self-cleaning vortex flow below and throughout the filter media. Easily maintained: Top to bottom rinsing. Thanks to the sloped square bottom of the KoiClear105, no extra supports are needed for positioning and equilibration. The Koi Clear does not include any tank fittings.You must drill your own holes and install your own bulkhead waterproof fittings in any location you need.We recommend you use standard long shaft 2" or 3" bulkheads for your waterproof fittings.Picture left shows a vortex style configuration. -1 bottom drain for cleaning. -1 mid tank inlet for water input vortex w/ 90 degreee elbow inside the tank to create vortex spin action. -1 top fitting for outlet.Also shown is optional Stainless Steel Stand. Inlet: Threaded Bulkhead Fitting : 2"
Sludge Drain: Threaded Bulkhead Fitting 1 1/2"
Suiteable for Koi Pond Volume Up to : 2,650 Gallons. *Transport Friendly can be Stacked for portability and shipping. *Can be used as Vortex or as Combined Vortex Filter. Easily Installed. thanks to the sloped square bottom of the Koiclear 105, no extra supports are needed for positioning and equilibration.